You can try Audio drive for MSI GE72 instead. I had the same problem with sound like you but the MSI driver seemed to work well. I have exactly the same issue. Please let me know if you found a solution to this. I trying to contact to dell by mail, but their mail technical support can not give me a useful solution.They ask me to contact their advanced software team by phone. However, It is not convenient for me to chat on phone. I wish someone could help me. I found the temporary solution. The main idea is "DO NOT LET THE AUDIO CHIP SLEEP"
For example, keep playing a audio which has no sound. You can use audition to create this mute audio. That is initially solution. 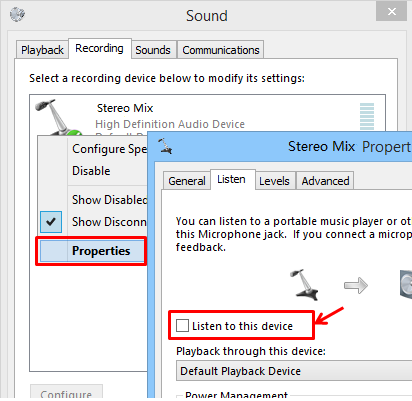 Right click on speaker icon ---- Recording Devices ---- Right click the Stereo Mix ---- Enable. Thank you very much for the temporary solution. I am listening to my system using the headphones and music from WMP. If mine were to be having your problem, would I hear the popping during the music and where exactly? The way you describe the problem it may not be related to a driver, but as you have shown, that could help in some circumstances. Have you installed any third party players? The Basic Microsoft driver has few sound tweaks so perhaps something the Waves software is putting some component in a problematic state. Info on what types of sound or file types/bitrates has the most problems or how it is being played, might help. I had a problem with an external speaker on another system popping after the music ended. In that case, just opening the recording dialog window from the speaker icon, would keep it from happening. There is no popping during the music. I have clean installed the origin windows 10 and installed nothing relate to audio software but realtek driver. There is also no popping whatever the Maxx is open or close. Why I think it is related to driver is "The popping never happens before driver installed, and I have tested it on Ubuntu 16", there is no popping as well. The popping only happens after driver installed. Also, some solutions to popping before and after audio is to modify the regedit to disable power management. This version of driver "Realtek Audio" (Not Realtek High Definition Audio) has no key related to power management in regedit. So there is no option to disable power management. Finally, in order to let the card chip working from sleep. I keep it playing a muted sound and find the temperary solution above. This workaround partially solved my problem. The noise is gone while using windows, but it persist before windows starts. If I'm using the Realtek driver I hear a background noise when the soundcard goes idle. If I switch to a generic driver I hear the a loud noisy every time it switches between ON and OFF.